I am thrilled to share the news with you about an upcoming art project! In the summer of 2018 I will have a duo art show with local sculptor Guthrie Gloag! 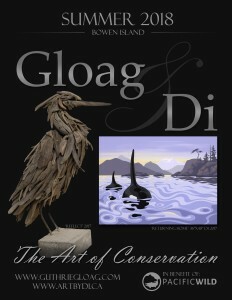 “The Art of Conservation” will feature wildlife and landscapes from southern British Columbia and the Salish Sea. It has been a long time goal of mine to use art to bring awareness and support for the protection of our wild places and I am so stoked that Guthrie and I can join forces to realize this dream. The show will benefit Pacific Wild (a non-profit conservation initiative based on Denny Island in the Great Bear Rainforest) and is to be held at the new Bowen Island Arts Council Gallery on beautiful Bowen Island, BC. Pacific Wild is a proud participant in the Great Bear Education and Research (GBEAR) Project, a project under the Tides Canada Initiatives Society. Formerly known as the Pacific Wild Initiative, GBEAR is focused on providing extensive education and research-oriented projects. Examples of programs carried out by the GBEAR Project include the Great Bear Sea Hydrophone Network, Great Bear LIVE and the SEAS (Supporting Emerging Aboriginal Stewards) Community Initiative. As a project of the Tides Canada Initiatives Society, GBEAR works to support the protection of endangered wildlife and rare ecosystems on the Pacific Coast through research and education-based endeavours. Outstanding Di! I would love to purchase a print of ‘Returning Home”…would love it for a Xmas present! With your new and refreshing style, you deserve a show to further highlight your work. It was great to talk with you at the craft show and look forward to see your new works. Possibly a new piece for out apartment back in Ontario!!!!!!!!! Thank you Wayne, that would be so wonderful!! It was great to meet you the other day :):):) I will be in touch! Bravo Di….this is exciting and such a worthy cause!